Vast floating islands of rubbish and debris, accumulated after torrential rains and flooding, are threatening to topple a bridge and jam two big dams in China, state media reported on Wednesday. One layer of garbage covering 15,000sq m – had lodged under a bridge in the north-eastern city of Baishan in Jilin province and was blocking water flow, the China Daily reported. Officials fear a fresh wave of flooding, if crews fail to clear the debris, could bring down the bridge. If the island is washed downstream, it could block floodgates at the Yunfeng dam, now operating at full capacity. Emergency services were scrambling to clean up the waterway, near the border with North Korea, but fear it could take days. "We have collected 40 trucks of the trash, but the remaining trash might fill another 200 trucks," the official Xinhua agency quoted police officer Wang Yong as saying. More rain is forecast in the coming days. In nearby Tonghua city, water supplies were restored on Wednesday, four days after flooding ripped apart pipelines, the official Xinhua agency said. 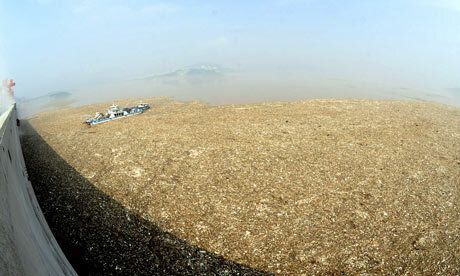 A similar vast garbage mat was threatening to jam the locks of China's huge Three Gorges dam on the Yangtze River in south-western China, state media reported this week. The crust of debris was jammed so thick in places that people could stand on it. Jilin has been devastated by floods this summer, with more than 140 people listed as dead or missing over the past two months. Nearly 800,000 people have been evacuated, 64,000 homes have collapsed and valuable farmland has been inundated.